Visual thinking means taking advantage of our innate ability to see – both with our eyes and with our mind’s eye, to discover ideas that are otherwise invisible, develop those ideas quickly and intuitively, and then share those ideas with other people in a way that they simply get. In this post, we are going to see how we can use visual thinking and pictures as a problem solving approach. This can also be used to learn, analyse or research almost anything. What are the problems that we can solve and what are the tools we need? Any problem can be made clearer with a picture, and any picture can be created with the same set of tools and rules. What are the tools we need to solve the above problems? The basics of visual thinking have nothing to do with creating charts on a computer. 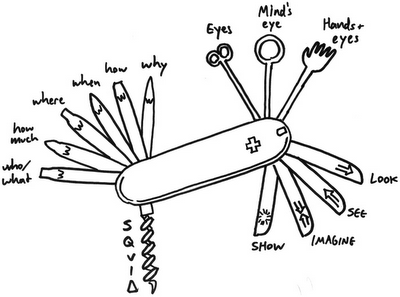 Visual thinking is learning to think with our eyes, and it doesn’t need any advanced technology at all. Why don’t we need more complicated tools? Do you need some special ability to do this? People who question it all. But regardless of what type you are, everybody already has good visual thinking skills, and everybody can easily improve those skills. 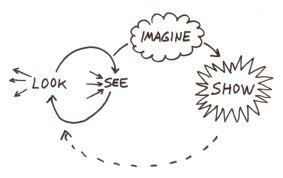 What is the guide rope to visual thinking? Portrait: Who/what:( renderings, profiles, plans, elevations, diagrams). They show the recognizable qualities that differentiate subjects. 3. If you start with one model, stay with one model. Map: Where( Venn diagrams, schematics, landscapes, think-maps). They show the spatial relationship of one object to another. If you map the six frameworks versus the SQVID we get the visual thinking codex, which is the master list of problem solving pictures. When you present to someone, again if you use the framework of look, see, imagine and show, you cannot go wrong. That’s all. Now use this to learn, analyse a subject, solve problems and research almost anything.